Asteraceae have the most endemic species of any flowering plant family in oceanic archipelagos, and these insular endemics display a higher frequency of self-compatibility (SC) compared to mainland composites. However, little attention has focused on the evolution of selfing in situ in islands. The genus Tolpis (Asteraceae) in the Macaronesian archipelagos consists predominantly of self-incompatible (SI) or pseudo-self-compatible plants, with one documented occurrence of the origin of self-compatibility (SC) in the Canary Islands. This study reports SC in two small populations of T. succulenta on Graciosa Island in the Azores. Progeny from the two populations exhibit high self-seed set. Segregation in F2 hybrids between SC and SI T. succulenta indicates that one major factor is associated with breeding system, with SC recessive to SI. Molecular phylogenetic analyses show that SC T. succulenta is sister to SI T. succulenta in the Azores, suggesting that SC originated from SI T. succulenta in the Azores. Plants on Graciosa are morphologically distinct from SI populations of T. succulenta on other islands in the Azorean archipelago, with smaller capitula and lower pollen-ovule ratios, both indicative of the selfing syndrome. The factors that may have favored selfing in these populations are discussed, as are the conservation implications of SC. Finally, the issue of whether the two SC populations are cryptic species worthy of taxonomic recognition is discussed. This work was supported by a General Research Fund grant from KU EEB to MEM. The authors wish to thank the director and staff of Parque Natural da Graciosa for their assistance in providing seeds of the Graciosa populations as well as population census and population origin information; Katie Sadler and Joshua Montgomery for assistance with plant propagation and for assessing levels of pollen fertility and seed set; Gil Ortiz for preparing the images; Griffin White for assistance with DNA extraction; Tina Kiedaisch for assistance with field work. 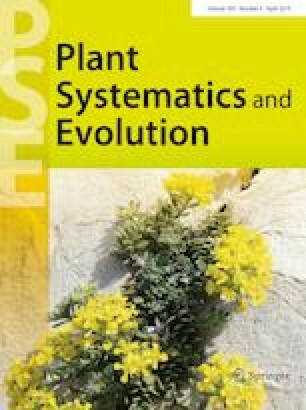 Special appreciation goes to Michael Gruenstaeudl for supplying seeds of Arnoseris minima and for providing constructive comments that greatly improved the manuscript.